Zabbix is exceptionally great monitoring tool that collects information from servers, virtual machines, network switches, routers, firewalls and other network enabled devices which allow you to examine it any problem occur. It has feature-wealthy notifications on emerging issues, but the integrated tools for data analysis and visualization aren't pretty easy to use. We can combine graphs into dashboards, but first we need to create them, and there is practically no easy way to create graphs that show real-time data. Also, there is no way to collect data from different machines onto a one graph. Grafana is a good alternative to Zabbix's dashboards. It lets you create graphs and dashboards based on data from various monitoring systems, and it specializes in the display and analysis of this data. It is lightweight, easy to install, and it looks beautiful. 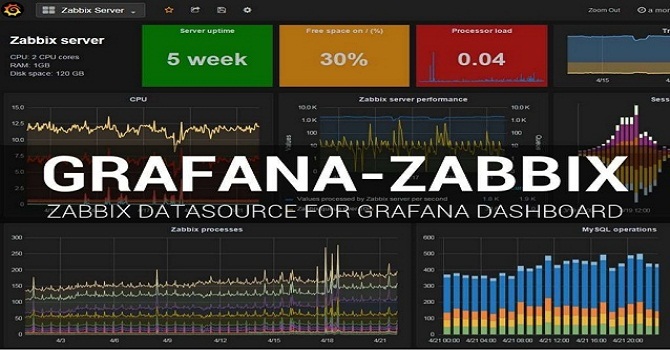 In this guide, we'll walk you through the steps to install Grafana and configure it to gather and display data from Zabbix and how to compose your own custom dashboard that monitors physical or virtual machine's CPU and file usage. Two CentOS 7 machines configured with sudo non-root users, with Zabbix installed on one server, and the Zabbix client installed on the other server. Follow the article How to Install and Configure Zabbix on CentOS 7 and its prerequisites to configure these servers. During the installation process you will be asked to import a GPG key. Confirm that you wish to import this key so the installation can continue. Grafana is running, so let's install the component that lets Grafana pull data from Zabbix. Panels: new blocks that can be used on the dashboard, such as pie charts or histograms. Data sources: new storage backends for your time series data, so you can pull data from other sources. Apps: complex plugins that bundle data sources and panels within a single package. We will use the Zabbix app plugin, which includes a Zabbix data source, a triggers panel, a Zabbix server dashboard, and a template to view data. Whenever you add or modify plugins, you must restart grafana-server for the changes to take effect. With the plugin installed, you can log in to Grafana and configure it to talk to Zabbix. Note: Grafana listens for incoming connections on port 3000. If you have a firewall configured, you'll need to open this port. The default login credentials are admin/admin. You can change your password on the Profile page once you log in. When you log in, you'll be greeted by the Home dashboard. 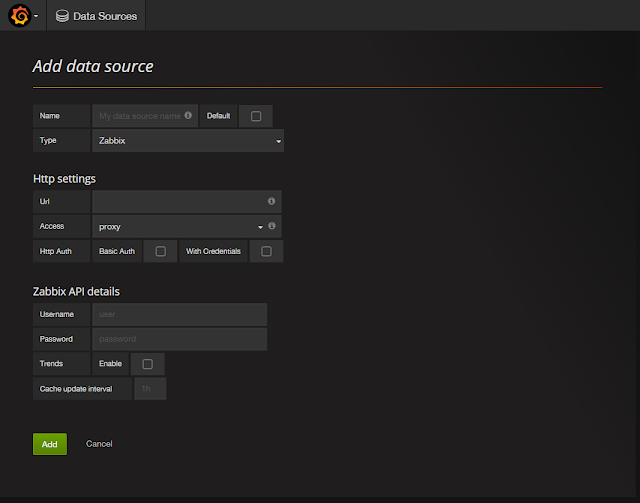 Access Grafana's main menu by clicking on the Grafana logo in the top left corner of the user interface. Then select Plugins. Then select the Apps tab. Then click on the Zabbix app and enable it by pressing the Enable button. Enter a name for this new data source in the Name field. 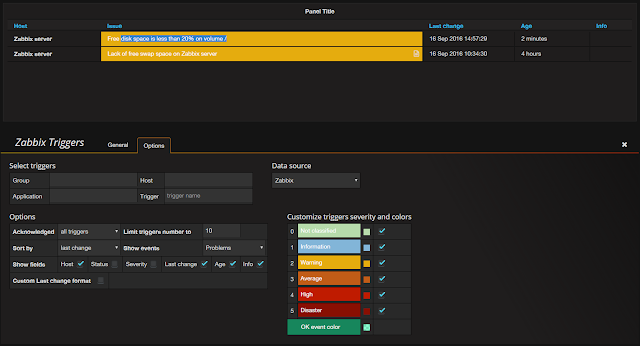 Check the Default option so this data source will be preselected in new panels you create. Select Zabbix from the Type drop down list. Fill in the Url field with the full path to the Zabbix API, which will be http://your_zabbix_server_ip_address/zabbix/api_jsonrpc.php. Fill in the Username and Password fields with the username and password for Zabbix. The default username is admin and the default password is zabbix. 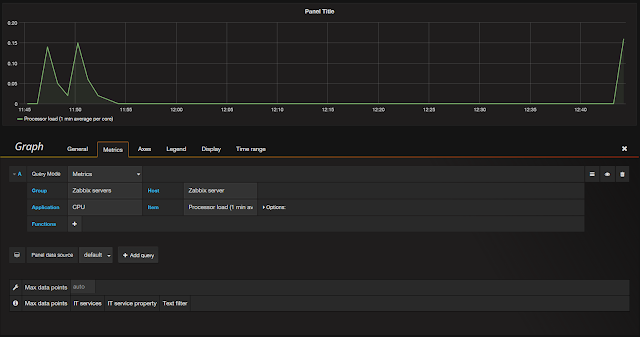 Enable the Trends option; it will increase Grafana's performance when displaying long time periods. You can leave the other options at their default values. If you do not see this message, check your credentials and test again. This dashboard is pretty informative, but you can create your own custom dashboard from scratch. 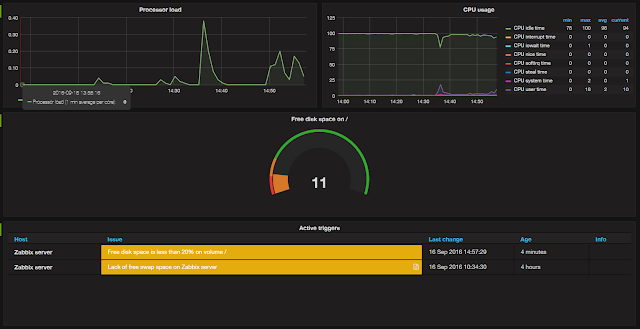 Let's create a dashboard for Zabbix that shows us CPU usage and file system information in real-time. Open the drop-down list on the top of the screen and click the Create New button. A new empty dashboard will be created. Each dashboard consists of rows which contain blocks. When you create a new dashboard, you automatically get one row. Click on the green menu on the left of the row to access the row's action menu. Here you can add new panels, set the row's height, move it, collapse it, or delete it. First we will create a graph that displays the CPU usage of our Zabbix server. Select the Add Panel item and then click Graph to insert a new graph into the row. Set Host Group to Zabbix servers. Set Host to Zabbix server. Set Item to Processor load (1 min average per core). You will see you current processor load on the graph. Then navigate to the General tab and set the Title field to Processor load and set the Span option to 6. One row can contain up to 12 blocks, so setting this value to 6 makes the panel take up half of the screen. Note: If you don't see any data, you may be zoomed out too far. Click the clock icon in the upper right of the interface and choose *Last 1 hour from the list of options. Change Title to CPU usage. Select the Metrics tab and change the Item field to /CPU.*/. You can use Regular Expression patterns for host or metric names. Just be sure to wrap the pattern in forward slashes (/). You can also show summary statistics. Select the Legend tab and you'll see some options and values you can select. Under Options, check As table and To The right. Under Values, select Min, Max, Avg, and Current. Next, add a Singlestat panel to show a single value for a particular metric. Create a new row by clicking Add row button and then select the row's menu, choose Add panel, and select the Singlestat item. Set Item to Free disk space on / (percentage). Next, switch to the General tab and set the Title field to Free disk space on /. Enable the Show option for Gauge. Set Thresholds to 10,20. This will display these thresholds on the gauge. Select the current option from the Value drop-down list. Return to the dashboard and press CTRL+S to save it. Now let's test how this gauge responds to real-time events. 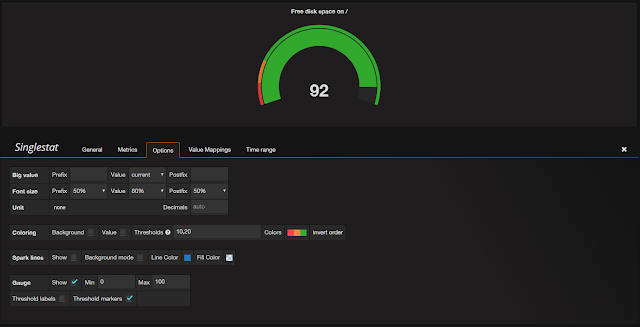 To do so we will manually reduce free space on the disk and see what the dashboard displays. Set the file size depending on the amount of free space on your server. Finally, let's show active Zabbix triggers on the dashboard. Create a new row and then select the row's menu, select Add panel, and choose the Zabbix Triggers item. You will see the active trigger notifying you about the lack of free space on the server. ou can now use this simple dashboard to get a quick look at the current state of your server. This will remove the test.img file. In a few minutes, the dashboard will update again to reflect the changes on the file system. 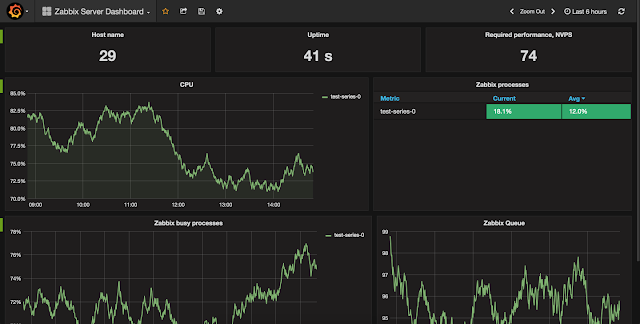 In this guide, we demonstrated how to install and configure Grafana, and created a custom dashboard with panels that displayed data from Zabbix. You can show these dashboards on desktops or even large screens to allow administrators to see the state of your IT infrastructure. Each panel on a dashboard can display data from a different server, and you can use Grafana to filter the data in many useful ways. It's difficult to describe all of Grafana's features in one article, so explore, experiment, and build your own beautiful dashboards.